Do you work with the TEI P4 versions of TCP XML files and wonder what all those tags mean? After surveying XML tags in TCP corpora, I made a spreadsheet that lists all of the tags, defines them, and mentions where you may find said tags within the XML documents. Download the spreadsheet from here. The survey and examining the files has made obvious that different TCP corpora have different levels of curation. The EEBO-TCP corpus has the most fleshed out metadata information. Not all tags are used across all corpora. According to my survey, Evans-TCP doesn’t use <FILEDESC>tags like EEBO-TCP and ECCO-TCP. Also, EEBO-TCP has the following tags that ECCO-TCP and Evans-TCP doesn’t: <AB>, <DEL>, <FW>, and <SUBST>. Knowing all of the tags and what they are used for has been important for VEP’s methods, since we’re writing a script that grants users flexibility for text extraction from TCP TEI P4 XML files. It uses a configuration file that indicates text to extract and ignore between XML tags. For example, if you want to extract plays without their stage directions, the configuration file will allow you to ignore the <STAGE> tags that contain them. For the spreadsheet I made, I obtained TAG definitions from TEI: Text Encoding Initiative. Yes, even ASCII symbols mess up VARD. Those who have tried to extract plain text from TCP TEI P4 or P5 XML files know how difficult it is. While coding tools to extract TCP text, the VEP team grappled with the order of operations to perform. Where is the best place in an extraction pipeline to convert the XML document to text? Where do we want to use VARD? As discussed in my previous post, processing XML files through VARD can be tricky. Non-ASCII symbols and XML tags interrupt the words that VARD needs to check against its dictionary, preventing VARD from recognizing words in their entirety. For the most part, VARD cannot process even ASCII symbols as part of words, which has implications for extracting and representing TCP XML files. In order to process TCP XML, the VEP team has had construct its character cleaner and text extractor to work with VARD’s constraints regarding symbols and XML tags. Furthermore, character cleaning and text extraction had to align with editorial principles. To illustrate, the team had to consider the extent to which its algorithms modified TCP text. TCP XML file structure and contents further complicated the modification. When extracting text, did we only want to extract what was definite (the characters) or also preserve the traces of illegibility (characters represented by symbols)? In the end, VEP decided to design character cleaning and text extraction tools that preserve textual information. It required figuring out character substitutions that worked with VARD to account for symbols nested within words. If a word contained illegible characters, the number of illegible characters would be maintained. However, the TCP’s bullet point that represents illegible characters doesn’t allow VARD to read the surrounding characters as one word. To address the dilemma, I generated a test text file with a word that had symbols interrupting it, quite like you will find in TCP corpora. I recreated the test for the post today, using the word unworthinesse. I wanted to see which ASCII symbols VARD would treat as part of words. As you can see in the screen capture to the left of VARD’s GUI, VARD successfully treats several ASCII characters as part of words–the entire word is highlighted. For the symbols not treated as part of the word,VARD doesn’t highlight them. Unsurprisingly VARD treats hyphens (-) as part of a word. Hyphens are a common feature of compound adjectives. Other ASCII symbols VARD recognizes are the tilde (~), the caret (^), and the equals sign (=). Missing words (lozenge in angle brackets: 〈◊〉) replaced by ellipses in parentheses ((…)). With the above scheme we preserve as much textual information as possible. With caret replacements, VARD has the opportunity to standardize words that have illegible characters. Future versions of our character cleaner may take advantage of the tilde (~) to help represent letters with macrons (ā to a~). Our character cleaner also removes certain XML tags to give the flexibility of using VARD on TCP files in text or XML format. Why are there so many? Because coding practices are incredibly variable. Everything is always already encoded. The first time I used VARD, discussed in my previous entry, it was a shiny toy, one with which I wanted to automatically process batches of TCP TEI P4 XML files. That was in February of this year. Since then, interactions I have had with VARD underscore the need to understand how the tools I use work. The public releases of ECCO-TCP, EEBO-TCP, and Evans-TCP texts is a boon scholars, who can use these texts as the basis for their scholarship. Those who wish to create digital editions and computationally analyze TCP texts may turn to programs like VARD to assist with crucial file pre-processing, like spelling standardization. Given the use of unsupervised or semi-supervised curation methods, those who work with TCP texts must be transparent about how they access, process, and analyze their data sets. The decisions involved in data curation impact interpretations that can be drawn from TCP texts. This transparency demands responsibility on the part of the scholar to know how their methods and tools manipulate the data within TCP XML files. The purpose of this entry is twofold. It is to make transparent decisions made by the VEP team to process TCP XML files. More importantly, it is to highlight how VARD has interacted with TCP files, providing a resource for scholars and the curious working with them. VARD’s default behavior has serious implications for the spelling standardization of TCP XML files. Why is it such a problem? VARD doesn’t handle non-ASCII symbols, and TCP transcription frequently includes them within words. When XML tags and symbols occur within a word, VARD processes the characters on each side of the tags/symbols separately. Symbols and XML tags are ubiquitous in TEI P4 and P5 versions of TCP XML files. They are integral to recreating early modern texts, rife with diacritical marks and foreign alphabets. To drive the point home, any letters with accents and macrons will not be recognized in VARD’s modern English dictionary. VARD will simply read characters on both sides of letters with diacritical marks as different words. XML tags create similar situations, just as diverse as non-ASCII symbols. They contain information from decorative initials to notes in the margin and the number of illegible characters. Before you process TCP texts with any tool, know the encoded contents of those texts. Be sure to check how processing alters the files. You might be surprised. The next will entry will discuss how the VEP team prepares TCP XML files for VARD, leveraging ASCII symbols during character cleanup and XML extraction. We have made great progress with Jonathan Hope’s early modern drama corpus. It now includes plays dated up through 1700, built from TCP corpora. By my count, it is comprised of 1,257 plays. A corpus of this size and origin requires considerable curation. Beth Ralston has spearheaded metadata collection and cross-referencing–quite the feat–from Glasgow. In Madison, the VEP team has worked on extracting necessary text from TCP XML files. This effort involved writing and tweaking python scripts specifically for TEI P4 versions of the TCP offerings. Additionally, the team has consulted with Hope to attempt standardizing the corpus’s unwieldy early modern orthography. To standardize the drama corpus, we are using VARD, a tool that aids spelling standardization within historical corpora. 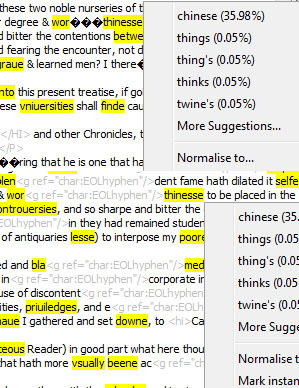 While VARD’s default is made to process Early Modern English texts, it achieves standardization by checking words against a modern dictionary. Therefore, using VARD necessitates modernization. Though not an exhaustive list, modernization in VARD entails: changing Early Modern English second and third person verb endings to modern ones (-eth to -s); expanding elisions (o’er to over); changing variants of a word to a preferred form of that word (ope and op’n to open); joining separate words into a modern equivalent (him selfe into himselfe). VARD standardizes 1-grams, that is, it evaluates one word at a time. Part of speech isn’t taken into account. VARD assesses a 1-gram against its dictionary (“words.txt”) and determines whether the 1-gram’s spelling is a non-variant or a variant. If the spelling matches a word in the dictionary, the 1-gram is marked as a non-variant and left alone. When a 1-gram’s spelling varies from what is in the dictionary, it is marked as a variant. VARD contains rules that manage how a variant is modernized, mainly a text file of modern spelling substitutions for early modern ones (“rules.txt”). This works at the level of the letter. For example, when VARD processes the word musick, a rule in the dictionary indicates that CK at the end of words can be replaced with just a C, enabling VARD to change musick to music. The rules allow for multiple variations based on a variant spelling to occur. To decide which variant a non-variant spelling will be changed into, VARD performs word frequency calculations (f-scores). The calculation is a confidence score that weights how probable a variant replacement is. VARD keeps track of how many times it replaces words with specific variants. The f-score is a measure of the precision of a variant’s spelling and its recall (percentage based on how many times a specific variation has replaced the marked variant before). 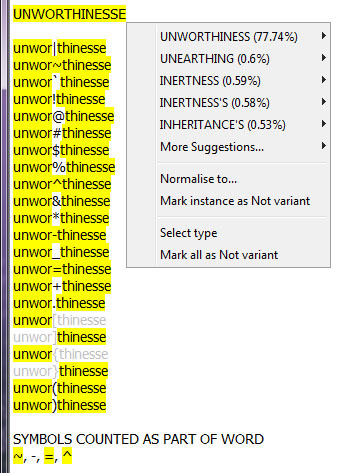 VARD has a normalization threshold that uses the confidence score to determine with which variant to replace a marked variant. That number is by default 50%. If a variant’s confidence score is above 50%, it will replace the early modern word under question. F-scores can be weighted to equally consider precision and recall, or it can be weighted to favor one or the other. In other words, VARD considers how to replace words according to what may be most correct or most probable based on how many times words occur within a corpus. Through a GUI, VARD allows users to manually correct texts one at a time or batch process based on the normalization threshold. Users can also process texts through command line. Standardizing the Early Modern drama corpus has required both. Following posts will contain documentation for the early modern drama corpus and tips/tricks for VARD.